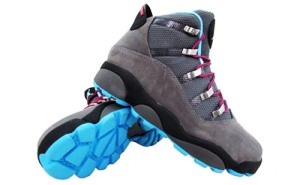 Jordan Winterized 6 Rings Now OUT! Itching to wear your favorite Jordan shoe during the snow and slushy day in the winter season? Then the Jordan Brand has a new shoe for you that would suit your lifestyle even in the winter season. The new Jordan Winterized 6 Rings is now out on the market and it has already received positive feedbacks for its impressive design and durability, giving the Jordan Brand a fresh start this New Year. The Cool Grey/Chlorine Blue-Black-Spark edition of the Jordan 6 Rings is arguably the best colourways of the shoe that is known for its toughness to absorb the wear and tear of the winter season. Can’t get enough of it? What are you waiting for, go and get one and you’ll get your money’s worth.